Trec Nutrition Protein Pudding is a powder concentrate for preparing a protein, chocolate flavor pudding. This supplement contains high quality calcium caseinate, combined with egg proteins and glutamine peptide enriched with a mixture of important vitamins. This product has been designed mainly for physically active people with an increased protein need. It is a good alternative to classic protein supplements and it can be consumed in the form of dessert by people on protein or low carbohydrate diets. Protein Pudding is a source of wholesome protein. It is important to the athletes who need much more of this macronutrient for the effective muscle growth and maintenance than people who are not physically active. This supplement uses two main sources of protein: calcium caseinate and egg proteins. They are characterized by an excellent amino acid profile and are rich in branched chain amino acids (BCAA). Calcium caseinate provides a lot of glutamine. The consumption of pudding speeds up the muscle development, helps to inhibit the catabolic processes and improves the body's regeneration process after the training. Protein Pudding is sated for a long time and does not burden the stomach. The calcium caseinate contained in this supplement belongs to the free-leaching proteins. In the stomach it creates a thick suspension, which is slowly digested. Such meal, although it has a relatively small volume, satisfies hunger and gives a feeling of fullness for many hours. It works great as a supplement or replacement for dinner; it will also be a good choice if the intervals between meals are quite long. Protein Pudding is very easy to prepare. This is important for people who would like to have a dessert, but they do not feel well in the kitchen, have no culinary skills, or simply do not have enough time, which is needed to prepare a tasty dessert. With Protein Pudding it is very easy. Just combine the powder with water or milk, using a regular shaker or blender to get a thick and velvety, lump-free pudding. You can treat it as an independent meal, or decorate with fruit, almond flakes or nuts. Protein Pudding provides important vitamins. They are extremely important for the proper body functioning, and physically active people should ensure their right supply. This product has been enriched with vitamins C and E antioxidants, that help to neutralize free radicals, which are produced during an intense physical exercise in large quantities. This pudding also contains B vitamins, which are important for the proper nervous system functioning and are involved in energy metabolism. 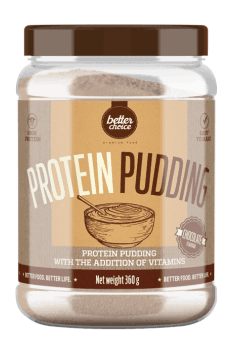 Protein Pudding does not contain sugar. This is an important message for people who choose conscious nutrition or prefer low-calorie or low-carbohydrate diets, where there is no place for simple sugars. Only recognized and tested sweeteners were used, excluding the controversial aspartame. Protein pudding promotes good health. This information will probably surprise many people, as sweet desserts are rarely associated with health and well-being. It turns out that by choosing the right ingredients you can enjoy tasty food and at the same time take care of your form. Both the vitamin and glutamine present in this Pudding present pro-health properties and are known for their positive action towards the immune system. Trec Nutrition Protein Pudding allows to easily increase the proportion of protein in a diet and at the same time satisfies the appetite for something sweet. Pudding is very easy to prepare; it can be an independent meal, or can be the starting point for a more extensive dessert with fruit or whipped cream. Ideally suited as a post-workout meal. Dissolve 2 measures (40 g) in 200 ml of water or milk, using a shaker or mixer. This product provides a solid portion of full-value protein. Perfect for the physically active people diets and excellent in high-protein or low-carbohydrate diets. For athletes, the best time for its consumption is during period of training. This powder combines well with water and milk. It can be mixed in a mixer or in an ordinary shaker. Pudding can be served alone, or decorated with fresh fruit, almond flakes or nuts.